As soon as I pushed past my fears and realized that all my passion projects have a common thread, that one compliments the other, that skills learnt on one project make me a master at another, I had a moment of enlightenment. I created time, balance, for all things that I wanted to do. There isn't any magic potion that can be bought at Diagon Alley that will turn you into some productivity wizard. It is knowing what works for you, and then making it work for you. So, before I share with you what I've been upto for the last two days (It got a little messy - I have scribbled notes, post-its and pages of plotting and planning and lists all over my desk) and how I plan to hit the ground running for 2018, take time out for some introspection and get to know what works for you. Are you someone who is a stickler for schedules, or are you someone who goes with the flow? Are you more productive with a deadline looming over your head, or are you your best self when feeling at ease? Or like me, you are someone who walks on a tightrope between the plotter and the pantser? Focusing on my intentions, setting my goals so as to have a more productive week, and most importantly connecting with my true self, were the guiding factors in creating this road map for the next year. I feel that this is a good exercise for any multi-passionate creative entrepreneur/ freelancer. Time and again I have been advised to pick a niche, to focus on one goal, to become an expert at one thing instead of getting all your fingers burnt by taking on too much. But the voice in my head always silenced any outside noise, it kept saying "You can do this, and this, and that, all at once." Even on the ugliest days, it would not shut up! And, I'm go glad, it didn't! I didn't need to put aside any of my passions, all I needed was to look inward and find a path of convergence. I identified and wrote down my purpose - to tell a story that inspires and instills belief, and it all came together - being an author, travel writer, photographer, entrepreneur, freelance writer - each of these interests stem from this very purpose. What is your purpose, your calling? What is your Why? Figure that out, and the rest will fall in place. While setting goals, most of us need to be reminded not to go overboard and list only actionable goals. My problem is quite the opposite. I get way too practical! I fear even thinking to myself, say, I'll publish two books next year. My rational brain automatically starts calculating the time I take to write (and procrastinate) and allows me to set my goal to publish one book a year. What happened to dreaming the big, bold and beautiful? I really had to silent the thinker in me and awake the dreamer for this exercise. It is the fear that crushes the dream, really. So, I asked myself this - what would my super successful year look like, if I couldn't fail? I then listed all my dreams, hopes and aspirations for 2018. It looks good! To hit the ground running and achieve all the fancy goals that I'd dreamt, I needed a course of action and a lot of preparation. For example, one of my goals for the next year is to get more freelance writing assignments. In the past, searching for a client with similar ethos and pitching to them was done on the fly. Yesterday, however, I created my dream-client list. My draft pitch, along with a few topics is ready. Later today, I will be drafting a list of short story contests for next year. That's another of my big goals! My favourite and the messy bit - Once I had all the goals listed, all the pre-work sorted, I set to map them out and create my intent calendar. Keeping in mind the importance of having a productive week, I listed my goals week wise, and kept enough white space for the day to day tasks along with all the whims and fancies that might take over me. 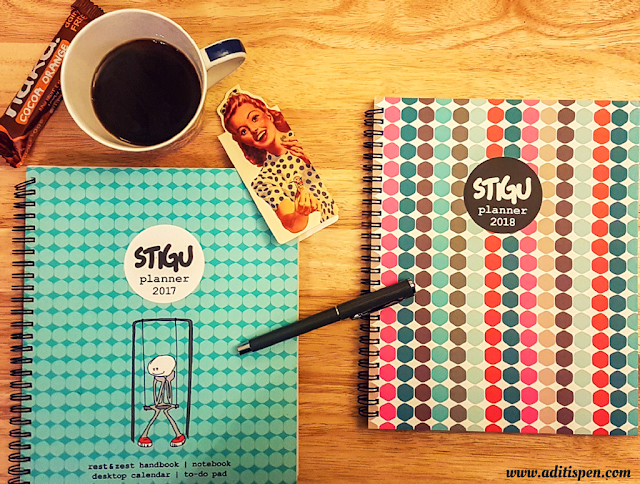 For this, the Stigu planner was the perfect tool, as it is laid out week wise with bursts of inspiration on every page. This will be my third year using this planner and you can see why I love it! So, for every week upto June next year, I have my goals listed on the left side. They maybe as simple as to learn about click-to-tweet button and add them to blog, to daily writing goals, to pitching to your dream travel magazine. I have kept enough time and space in each week to tackle the unknowns. I have experienced burnout and it was my emotional meltdown not so long back that got me to reflect on the goodness of authentic living, on the beauty in slowing things down, on the importance of carving personal time for yourself. I have never truly thought what my non -negotiables should be in life until yesterday. And it didn't take me long to come up with these four - to exercise daily even if it is a walk, or rounds of Suryanamskar, or on days I'm feeling all pumped a proper workout; to go out at least once a week for nature walks that fill my soul with creativity; to take a self-care day at least once a month which means getting pampered in a salon; and to get rid of my worst habit, switching off my phone at bedtime. So, this is the base of my intent calendar. My focus is to have a productive week, keep things going and improvise where needed. Planning for the year ahead, creating this intent calendar has given me such confidence and put the power back in my hands. I'm raring to go! 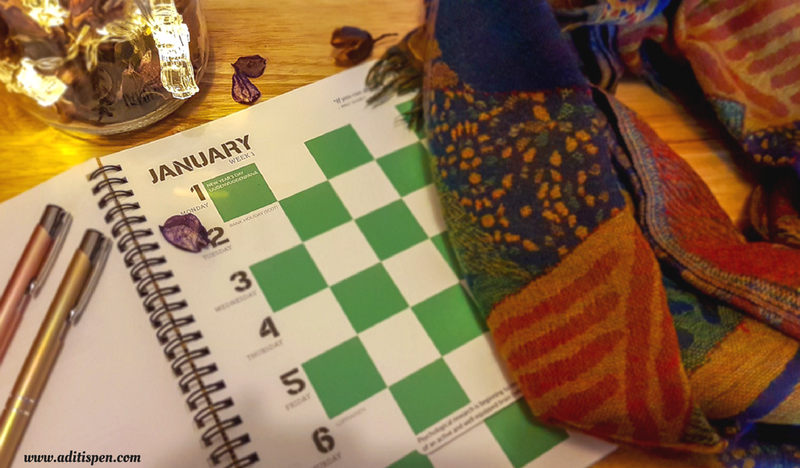 What about you: Are you ready to embrace the new year? What techniques and tools do you use for goal setting? And before you go, the lovely Akshata is hosting me on her blog today, do check out my post 'Traveling - A Love Affair' and shower some love! Merry Christmas! Any plans for 25th? Aditi, this is awesome. I am procrastinator and at the same time swim against the tide to help myself achieve my writing goals. You are such a motivator. I'm like that too! Hope 2018 proves to be a great writing year for both of us. 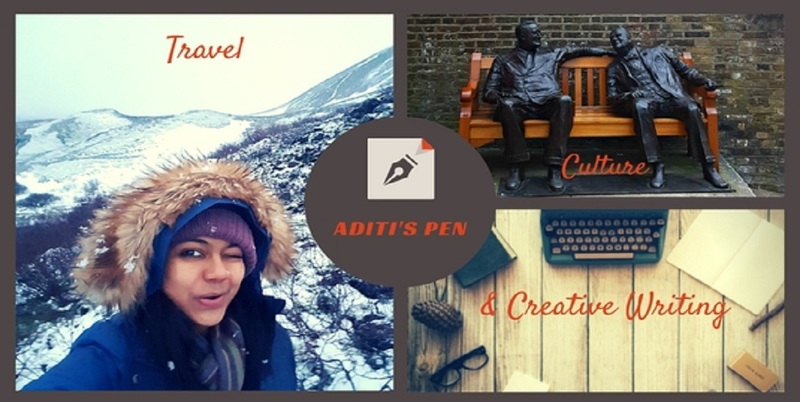 Inspirational Aditi! Running off to go plan something atleast for the first week.. I've got a new planner from Bullet Planner in Aus for 2018 to keep my work and my writing/personal goals separate. Previously I've used the same diary for personal stuff and my work as a psych but this year, I think it's best to keep them different as I really want to focus on the writing. I'm aiming to start some planning in the next few days. Your planner looks amazing! Hope 2018 is wonderful! Yes, I think a separate planner for writing will do wonders! You have grown as a writer so much in 2017 with Nanowrimo and winning that short story contest, hope you continue writing next year too! Wow! This is so so productive of your Adi; I havent ever done this nor do I think I am going too. This is just way too much effort for a lazy bum like me who loves to take each day as it comes along. Love the planners. All the best with this planning and I hope 2018 is a far happier and fulfilling one by far!! love n hugs!! Thanks Shalz! Oh, I was the person who went with the flow and never planned anything. But this goal setting, I have realised, helps follow your intent with action. This excercise gave my confidence a boost for sure. Do try it out! Wishing you a happy & productive 2018! Can we please be BFF, coz this is me and this is exactly what Ive been telling, no screaming from rooftops and everyone looks at me like am a madwoman. To be honest, I was never the planner so to speak. But this goal setting excercise and creating my intent calendar has to be the best thing ever! Your blog looks fab and congratulations on all those achievements this year! Here's wishing you a super duper 2018! That planner is so pretty. I'm trying out a Bullet Journal this year and although I abandoned my attempt last year, I have the feeling this year it will work. Thanks Corinne! I have heard lovely things about bullet journaling, enjoy! Wishing you a very happy new year! I have always been a planner, but these past 2 years, I haven't been able to accomplish everything (or even most things) on my to-do. Part of the issue is that my plate is too full, part of the issue is procrastination. But I still try..
And I believe that is all we can do. Keep moving. One step at a time. And also, in my case, this year, I'm aiming for progress, not perfection. Hopefully that will help me get out of the rut. I wish you achieve all that you hope to accomplish in 2018. Have a rocking new year! True, all we can do is keep moving! And your quarterly goal posts are so motivating! Let's do it and have a great year ahead! I can so relate to this. I can't stick to any plans nor have I patience to sit and finish the planning process without overwhelming myself. Hence this year I made a plan for a month alone. That is definitely a gaint leap for me. Let us it doesn't fail massively. All the best for a great year. That's definitely progress, do re-evaluate at month end, it would really help! Have a great year ahead!